A preponderance of personal property is an almost universal problem for Americans who have easy access to both credit and cheap goods. Everywhere you turn, there are suggestions and advice on how to declutter, live simply, and embrace minimalism. Often the suggestions start with the idea that you need to be brutal when culling your possessions. If you're not the type to commune with your higher self in an empty room in a mountain cabin, such decluttering advice seems far too extreme. Even if you do hope to achieve Zen mastery of your minimalist home, the cull-it-all type of advice can be wildly optimistic for anyone who has things other than decluttering going on in their lives. Before your possessions became clutter, they were cute items on retail shelves that you couldn't resist bringing home with you. The easiest way to deal with clutter is to not create it. Commit to only buying items you truly need and learn how to say no to free stuff — whether it's swag from the company retreat or hand-me-downs that you know won't be used. Many decluttering experts will give you what amounts to an assignment to declutter — either commit to getting rid of one item a day or declutter over a weekend. An easy way to divest yourself of things is to get rid of them as you notice them. It's very easy to look at the stack of cough medicine measuring cups in your bathroom drawer and think, I'll get rid of those later. But there is no time like the present. When you notice something that doesn't need to be in your house, get rid of it right away. Part of the reason why it can be so difficult to get rid of perfectly good items is the fact that you don't have enough to make the trip to Goodwill worthwhile. So get in the habit of leaving a bag for donations by the door, so that you can collect the items you plan to donate without allowing them to continue to clutter up your space. I am embarrassed to admit that I have been carrying three bags of clothes and other miscellany in the trunk of my car for over six months. I intend to donate the items to Goodwill, but I am out of the habit of making donations as part of my regular errands. When I regularly go to Goodwill or the Salvation Army on a weekly or twice-a-month basis, it is much easier to commit to decluttering. Find the local donation center for you, and plan on making a stop there every week or every other week on the same day you go grocery shopping. Make donating items a regular habit. This rule will allow you to determine just how often you use things you are afraid to give up. Set up this box in the basement or the garage, and as you clean, place items you don't use but don't want to get rid of into it. Once the box is full, seal it and date it for one year in the future. If you have not used the items in the box within that year, then donate or trash the box without opening it. It's likely you won't even recall its exact contents. If I needed this item, where would I look for it? That will prompt you to put item away in its new, sensible home. If I needed this item, would it ever occur to me that I already have one? If it wouldn't, then you can go ahead and get rid of the item because you'd just buy another one anyway when the need for it arises. Answering these questions will force you to make a decision about each item you find. It can be difficult to part with items you don't need if you spent good money on them. You would hate to waste the hard-earned money you spent by donating or trashing a perfectly good item — so you plan to either start using it or sell it, neither of which happen. A simple attitude adjustment can help to make this conundrum much simpler. Remember that the money has been wasted already, and is therefore wasted whether or not you keep the item. So you might as well not also waste the space on the item in addition to the money. Why give up both your money and your clean home to something that was a waste? If you are paralyzed by the size of your decision to get rid of some things, try looking at your decluttering in reverse. Start by asking yourself, "What items would I replace if I lost everything in a flood or fire?" You can feel confident that anything you'd be willing to buy again is something worth keeping, whereas the things that you wouldn't replace can go. While getting rid of things can be psychologically difficult, giving gifts tends to feel great. 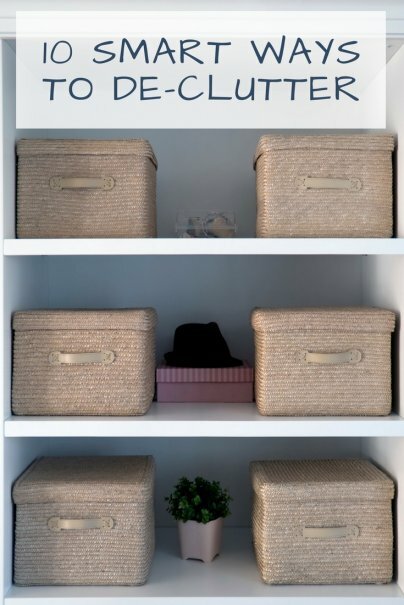 So start thinking about decluttering as an opportunity to give your family and friends things they would love. For instance, as you look through your books or DVDs, pull out any that you think a friend or family member would enjoy. If you have a set of fancy china you don't use, give it to a friend who collects china or one who needs a set of dinnerware. To make sure you're not just shifting the clutter to another person, make sure you ask before you give the gifts to your friends and family — and be willing to take no for an answer. Similarly, instead of hitting the Skip Advertisement button on the YouTube video five seconds in, let the commercial play and you can take that time to find the dry pens and stubby pencils that are cluttering up your office drawer. Anytime you are forced to wait is time you could use to find something that no longer belongs in your home. The thing to remember about finally achieving your decluttered home is you will need to commit to making decluttering a regular habit. Unfortunately, there is no point at which you are done — but that also means that small actions taken on a regular basis can make a huge difference.